Human that I am, this year I determined to extend seasons at will. This is the first time I have forced bulbs, and I love the results. 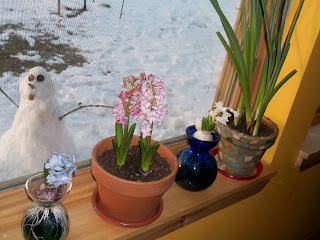 Next, tulips and grape hyacinths! I enjoy planting flowers, preferably ones that require very little input, and I look forward to exchanging clumps of perennials with my neighbors. ...and we just picked up some tulips from the local garden center. the first time we've scene them here. funny how that works.